Kelly Gardiner’s latest novel is Brimstone, the first in a middle-grade time-slip series, The Firewatcher Chronicles. Her previous book, 1917: Australia’s Great War, was shortlisted for the NSW Premier’s Young History Prize and the Asher Award. 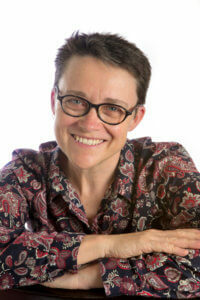 Her other books include the young adult novels Act of Faith and The Sultan’s Eyes, both of which were shortlisted for the NSW Premier’s Literary Awards, the Swashbuckler trilogy, and Goddess, a novel for adults based on the life of the seventeenth century French swordswoman, cross-dresser and opera singer, Mademoiselle de Maupin. She teaches writing at La Trobe University. Kelly is also the co-host of Unladylike, a podcast about women and writing, and the HNSA podcast, Imagining the Past. Kelly is a member of the HNSA Committee and will appear at the 2019 Conference. She is a co-convener of the academic program. Kelly’s latest book is Brimstone.